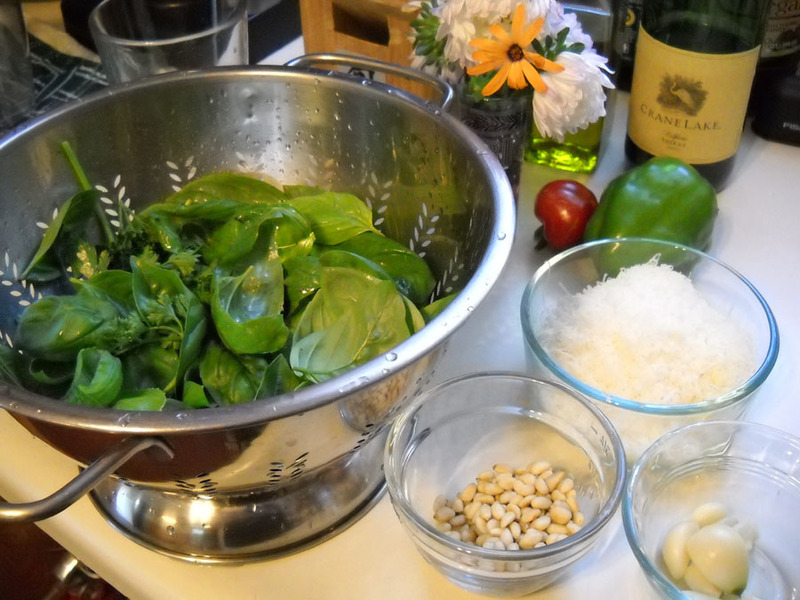 Traditional pesto is made with basil, garlic, pine nuts, Parmesan cheese, and olive oil, but today there are many variations of “pesto” using different herbs and other ingredients. Also, a traditional pesto is made with a mortar and pestle — the word pesto originated from the Italian word pestare, to pound or to crush. The traditional ingredients are still my favorite, but I do take the modern route and use a food processor to blend my ingredients. Each summer I make several batches of basil pesto and freeze it in cubes using ice cube trays for portioned use throughout the year. Last weekend I made my second batch of the season, and I plan to make a few more before my basil plants stop producing. I have been making pesto for years, and I no longer need to look at a recipe; I just wing it; although if I were to use a recipe, Sherri Brooks Vinton’s recipe in Put ’em Up! is almost identical to my own. I’d like to share her recipe with you in hopes you will give it a try. Pour the oil into a blender or food processor. With the motor running, toss in the garlic and process until the garlic is puréed. Add the Parmesan and pine nuts, and process until smooth. Add the basil, and process again. Season with the salt and pepper. Refrigerate: Transfer to a small bowl or jar, and refrigerate for up to 5 days. Freeze: For single-use cubes, transfer to an ice cube tray and freeze, then store in a freezer container. They’ll keep frozen for up to 6 months. Put ’em Up! also gives a few nontraditional recipe variations on pesto (Dill with Feta and Cilantro), along with ideas on putting your pesto to work (Pesto Vinaigrette and Pesto Dip). My favorite ways to use pesto are on homemade pizzas in place of tomato sauce, on grilled veggies and grilled veggie lasagnas, in pasta salads, added to the cheese sauce for a twist on homemade mac-and-cheese, and lathering it on chicken before baking for bold flavoring.